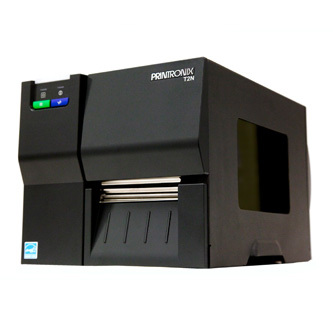 Printronix T2N | Industrial Printer | Esskay Technologys Pvt. Ltd. The T2N Series features simple design, ease of use and outstanding value that’s priced below competitive printers. It is the first entry-level industrial thermal bar code printer to offer Ethernet NIC connectivity as a standard feature. Additionally it includes a real time clock, direct thermal and thermal transfer printing capability and the industry’s highest reliability and performance you have come to expect from Printronix. Workers in distribution, manufacturing, logistics, retail and healthcare will appreciate its simplified user interface and rugged compact design. The T2N is a “best value” because of its outstanding performance and variety of standard features not usually found in this price segment. The T2N comes standard with features usually found only in more expensive thermal bar code printers. Although Printronix created the lowest-cost thermal bar code printer in its class, we didn’t overlook our commitment to quality in developing the T2N series. You’ll put the T2N to work faster because it’s so easy to use. For applications that require individual labels or groups of labels for applications such as item level part numbering or pallet labeling, the T2N printers may be ordered with a cutter mechanism installed (for cutting tags and label liner), or the option can be installed by an authorized service representative at a later date. Once installed, the printer can be configured to automatically cut media after each or a specified number of labels are printed. The Peel and Present mechanism automatically peels the label from its backing and presents self-adhesive labels one at a time. It replaces manual label peeling, making your production lines faster and more efficient. The T2N printers may be ordered with a peel and present mechanism installed, or the option can be installed by an authorized service representative at a later date. Once installed, the printer can be configured to automatically peel and present each label. For applications that require Hangu, Hanzi, and Kanji fonts.